Wowie-wow-wow! Here comes everyone’s favorite 6-year-old Junie B. Jones! Junie B. (don’t forget her B.!) is a feisty, funny, and lively little girl whose outspoken honesty often gets her into trouble, both at school and at home. The beloved character from Barbara Park’s New York Times bestselling series is ready to meet you! 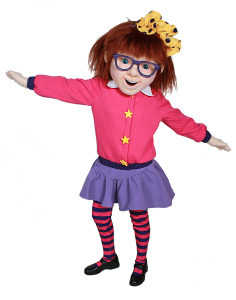 The wearer of the Junie B. Jones costume should be a 5’ -5’6” female with slender build. The rental fee for the Junie B. Jones costume has been graciously provided by the publisher Random House for promotional use only at schools, libraries, and bookstores. The only cost to you is Second-Day Air shipping arranged by Costume Specialists to send the costume to its next event which is only $140.00. Search for us on Google: Junie B. Jones Costume Character rental or Junie B. Jones Character Appearance Program.